Cameron Rupp's eighth inning homer tied the score, and Nick Gordon's single delivered the winning run as the Red Wings beat Lehigh Valley 7-6 Sunday afternoon at Frontier Field. The game was played in stifling mid-90 degree temperatures. After two games in Pawtucket, the Wings will return home to host the PawSox at 7:05 p.m. on July 4th. In the second, Rochester used three base hits and a pair of IronPigs errors to take an early 3-0 lead against starting pitcher Cole Irvin. Following a leadoff double from Kennys Vargas to open the inning, a triple from LaMonte Wade scored Vargas, giving the Wings a 1-0 lead. Lehigh Valley shortstop Dean Anna then dropped a fly ball off the bat of Chris Carter, allowing Wade to cross home and give the Wings a 2-0 lead. The last run of the inning came on a fielder's choice from Byron Buxton, allowing for Carter to score and give increase the lead to 3-0. Lehigh Valley answered back in the third against Rochester starter Kohl Stewart, who was making his season debut for the Wings after his promotion from Double-A Chattanooga. After allowing a pair of base hits with two outs, Damek Tomscha singled against the defensive shift allowing for both runs to score, cutting the Rochester lead to 3-2. The IronPigs took the lead in the fourth after Joey Meneses doubled to open the frame. After moving to third on a groundout, Meneses scored on a sacrifice fly from Matt McBride to tie the game at 3-3. . After Stewart allowed three consecutive two-out singles, Danny Ortiz scored to give Lehigh Valley a 4-3 lead. In the fifth, Tomscha blasted a solo home run against Stewart to increase the IronPigs lead to 5-3. Rochester tied the game in the sixth after Vargas doubled to lead off the inning. With one out, Vargas scored on a ground rule double from Carter, cutting the IronPigs lead to 5-4. Irvin was then chased from the game and in relief, Hoby Milner walked Rupp to put a pair on. The runners moved into scoring position following a wild pitch and Carter scored after an RBI groundout fromLeonardo Reginatto to tie the game at 5-5. The run was charged to Irvin who went 5.1 innings allowing five runs on six hits. He threw 88 pitches, 64 for strikes. Stewart's debut ended after 6.0 innings. He allowed five runs on 10 hits while walking one and striking out six. Stewart threw 95 pitches, 59 for strikes. Nick Anderson took over for Rochester to begin the seventh and allowed a go-ahead home run to Alexi Amarista on the first pitch of the inning, giving Lehigh Valley a 6-5 lead. The Wings answered back and took the lead in the eighth after Rupp lifted a 441-foot solo home run against Tom Windle, tying the game at 6-6. With two outs, Gregorio Petit struck out but reached first after a wild pitch. After a single from Buxton, Gordon recorded an RBI single to score Petit to give Rochester the lead 7-6. Anderson went 2.0 innings allowing one run on one hit while striking out two. 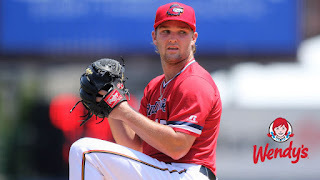 He was replaced by Alan Busenitz to begin the ninth inning, and Busenitz worked around a lead-off single to set down the side and preserve the win. Box Score: Click here for the box score and play-by-play narrative. NOTES: Byron Buxton went 2-for-5 with an RBI and Jorge Polonco did not play today as part of their MLB Rehab assignments.